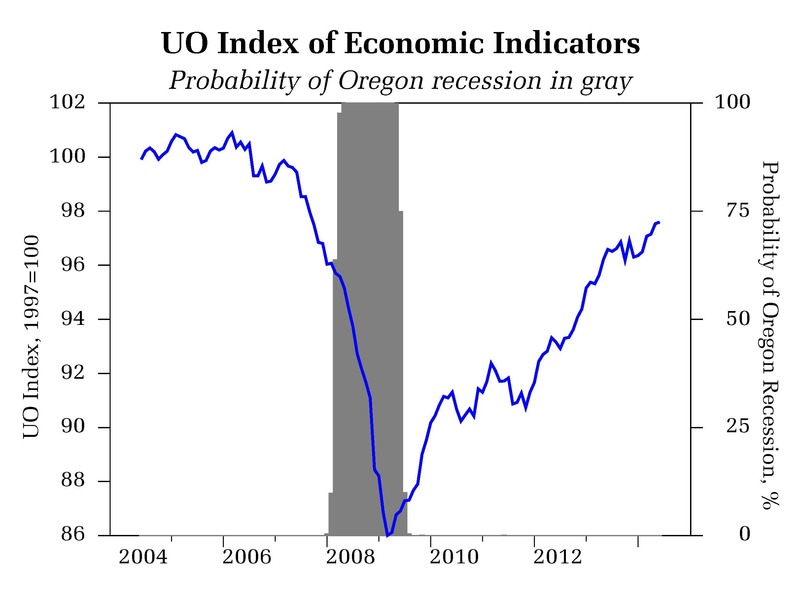 The June 2014 State of Oregon Economic Indicators is now available here. Special thanks to KeyBank for their generous support of this project. The Oregon Measure of Economic Activity to -0.60 compared to a revised 0.68 the previous month. The three-month moving average, which smooths month-to-month volatility in the measure, is 0.08 where “zero” for this measure indicates the average growth rate over the 1990-present period. Note that the occasional fall in the measure during expansions is not uncommon. Declines in the manufacturing, construction, and leisure and hospitality employment components jointly contributed a -0.81 weight on the measure. Note though that employment data can be volatile, and these numbers are likely to be revised higher in later releases. Hours worked in manufacturing, initial unemployment claims, and education and health services employment all made substantially positive contributions to the measure. The unemployment rate was a neutral factor. 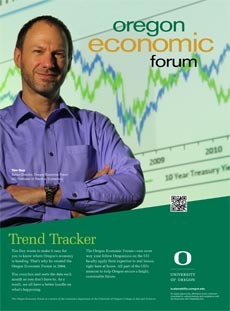 The University of Oregon Index of Economic Indicators rose 0.1% in June; most measures were improved modestly during the month. Residential building permits (smoothed) were flat while the Oregon weight distance tax, a measure of trucking activity, rose, extending a recent upward trend consistent with expanding economic activity. New orders for core manufacturing goods and average weekly hours worked in manufacturing both gained, signaling continued growth in Oregon’s manufacturing sector. Consumer confidence (smoothed) gained modestly, partially reversing the previous month’s decline. Taking into account the volatility of the employment data, the two indicators suggest continued growth in Oregon at an above average pace of activity.